Since starting work, my skin has been somewhat neglected and as a result it's now rather dry and dull looking. 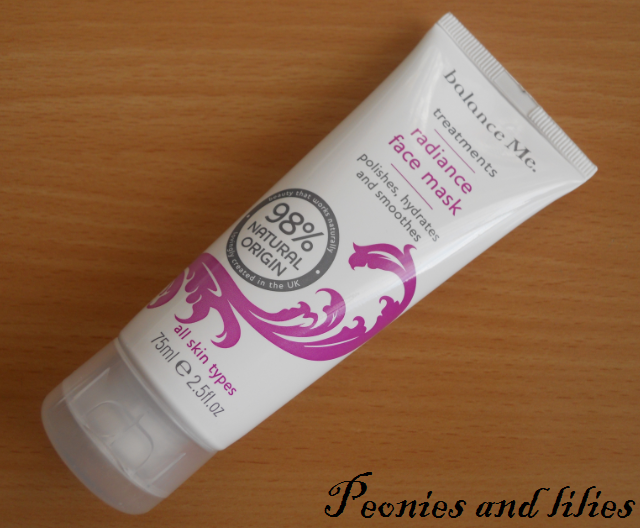 With that in mind, I decided to put Balance me radiance face mask to the test. The fact that it was a triple action face mask really appealed to me, and I like that I can exfoliate, deep cleanse and hydrate all in the space of 5 minutes. I usually exfoliate once a week anyway, but with this, I can just leave it on whilst I condition my hair and it barely adds any extra time to my beauty routine. The face mask itself is unscented, and I found the ground walnut shells to be really gentle on the skin. In terms of hydration, it's not the most moisturising of face masks, but my skin definitely felt more deep cleansed afterwards, and the gentle exfoliation helped to add some much needed radiance. Overall, I think this a good multi purpose face mask. 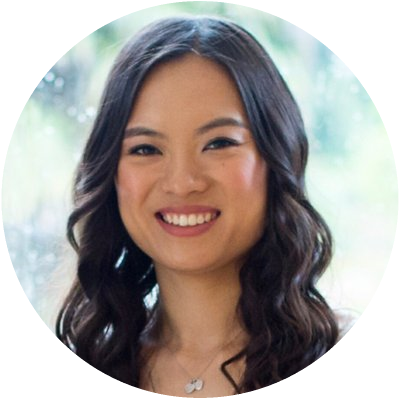 Definitely one to check out if you want a more natural skincare routine or if you're super busy and struggle to find the time to treat yourself. PS. Balance me are also giving away £200 worth of products on their website. For more information and to enter, click here. 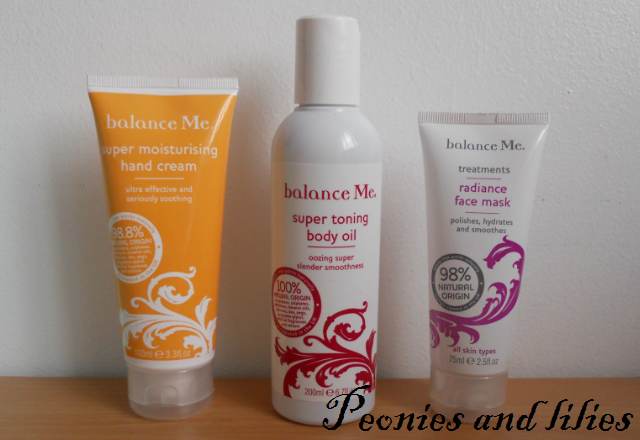 Have you tried anything from Balance me? What's your favourite face mask? With that in mind, Clinique have spent 6 years developing this new range, and if you do suffer from sensitive skin, then you'll be glad to hear that it's been tested and approved by both dermatologists and opthalmologists. Now I can't personally vouch for the gentle formula of the nail varnish (as much as my skin drives me up the wall, it is on the whole fairly tolerant) however I will say that they've got some beautiful on trend colours, the formulas are easy to apply, and at £12, it's on par with other high end nail polishes. 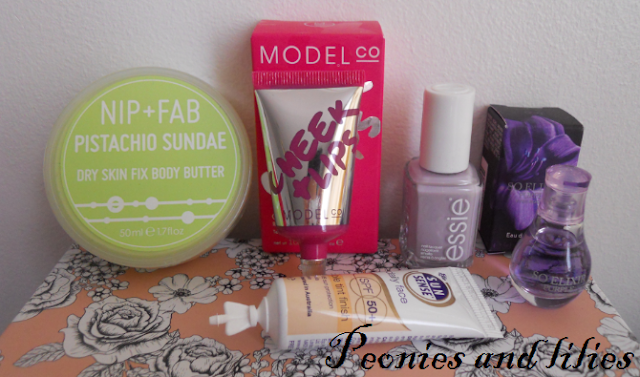 And my top picks for Spring/Summer? Pinkini, Grape ice and Hot date, all three of which are eye catching hot pink shades, which will look great with a tan! Clinique a different nail enamel will be available online from 25th April, and in stores from 31st May 2013. 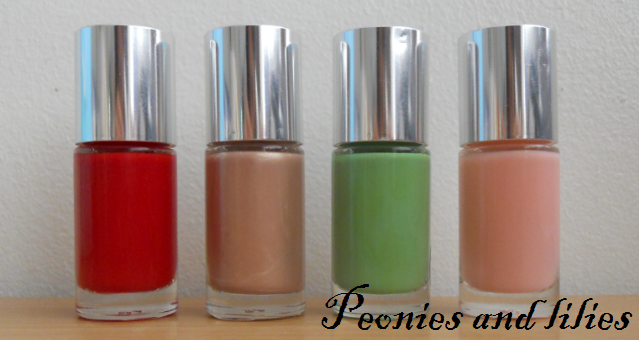 Will you be trying the new Clinique nail enamels? What are your favourite Spring/Summer shades? And it's not just the box that's special - they seem to have put a lot of thought into the contents too. In fact it's one of the few boxes that I can actually see myself using all 5 samples, There's a good mix of high end brands too. Essie has been on my wishlist for quite some time now, and the lilac grey Nice is nice shade couldn't be more perfect for Spring. The Nip +Fab body butter is another product that gets a lot of rave reviews, and I can't wait to give Model Co cheek and lip stain a try. It sounds like it could be a good alternative to Benetint, one of my favourit lip colours at the moment. So all in all, a great box from Glossybox. They seem to have really improved the contents of their boxes recently and I can't wait to see what they've got planned for May 2013. 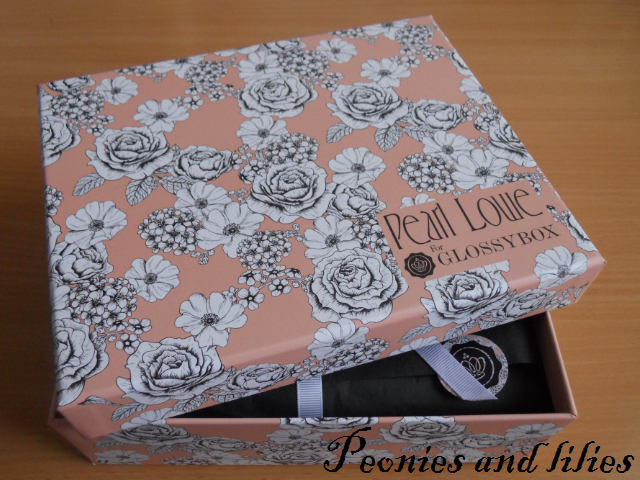 Are you a Glossybox subscriber? What do you think about this month's contents? Each palette comes with a choice of 4 complimentary shades, and there's a good mix of matte, gloss and satin finishes. I like the fact that each shade is individually named, and as you'd expect from Sleek make up, packed with pigment. The textures do vary though, with the matte colours being firmer and the gloss shades much softer and creamier. In some ways, these remind me of the Sleek pout paints (their equivalent of the OCC lip tars). Like most matte lipsticks, it's not the most moisturising, so a slick of lip balm is essential before hand, but the glossy shades are lovely. For everyday use, I would still stick to traditional lipsticks and glosses, simply because they're quicker and easier to apply, but for my travel make up bag these are perfect. The matte black packaging is firm and study, and from a convenience point of view, it's great to have 4 lip colours in such a small compact palette. Sleek make up lip 4 lipstick palettes will be available in stores and online at Superdrug.com from 8th May 2013. What do you think about the new Sleek make up lip palettes? 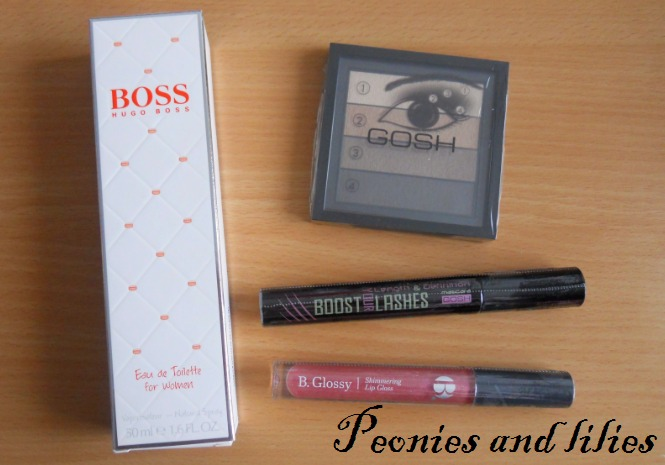 What are your travel make up essentials? And the winner is Elfie! Congratulations Elfie, can you please email me your postal address by 21th April and I'll get your prizes posted out asap. To start off with, I like to set the mood by lighting Neom invigorate, my favourite scented candle and one that's perfect for spring with it's blend of bergamot, grapefruit and lime. Candle lit, I then move on to a pampering face mask. At the moment I'm liking Biotherm hydra detox as it seems to both rehydrate and detoxify my skin at the same time. Whilst the face mask is on, I get to work using No 7 nail and cuticle care cream. My hands have been rather battered recently, and I find this really helps to strengthen and inject some much needed moisture back into my nails. By the time the face mask is washed off, this has sunk in, leaving me a nice base for my nail colour of choice. 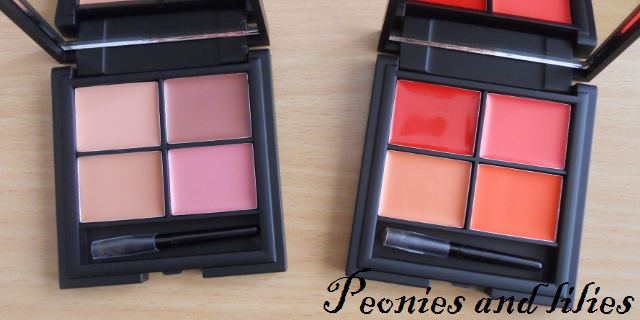 And because we're finally getting some sunshine in the UK, I've been drawn to the new Bourjois Rendez-vous a Paris collection. Prepp'hibiscus would be my top pick and Oh so rose a close second on days when I need something more subtle and chic. Finally, no girl's night in would be complete without a boxset of my favourite TV show and some mint ice cream. My top picks? One tree hill, Gossip girl, Grey's anatomy and The OC. Do you prefer to stay in or go out? What's your favourite TV show? *Blog post in association with Ladbrokes bingo. Starting with their new Rouge edition shine lipsticks, which was by far my favourite product on the day. 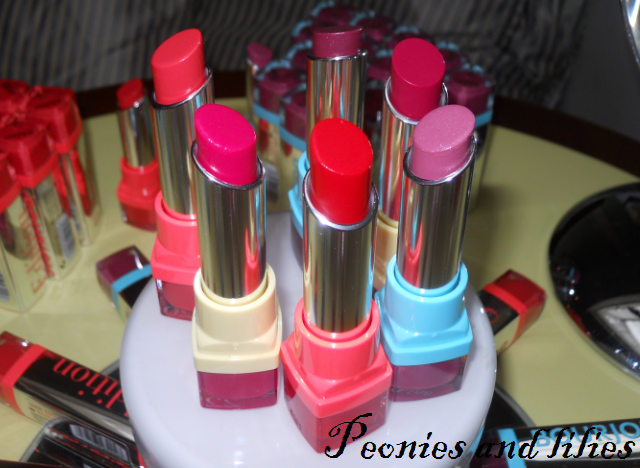 There'll be a choice of 6 colours, and for someone who likes sheer moisturising lipsticks, these are perfect. The lipsticks are creamy and glossy, and although sheer, they can be build up for up to 4 hours of intense colour. Did you know blusher was the first product that Bourjois ever created? The brand turns 150 this year, and to celebrate they've brought out a limited edition design for 3 of their best selling shades. 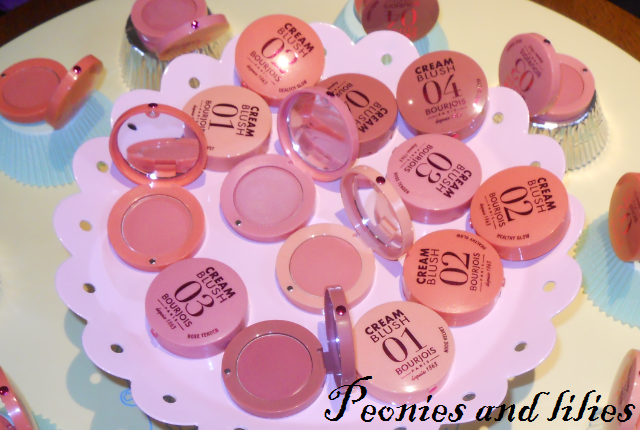 Along side that, there are also 4 new cream blushers. I thought they had a nice cream to powder finish, gave a lovely glow to the skin and for a cream blusher, relatively long lasting too. I'm predicting these'll be a big seller this summer. For the nails, there are 3 new 1 seconde shine nail polishes and of course it wouldn't be a summer collection without some bronzing products. Bourjois have gone for a Summer on the Riviera theme, and there'll be a choice of bronzing powder, BB cream and a rather interesting titled bronzing primer. Having tried it in person, I would say it's more of a mousse than a primer and I suspect it may be a good high street dupe for the infamous Chanel tan de soleil. Bourjois SS13 products will be launching in stores and online at Boots.com from May onwards. 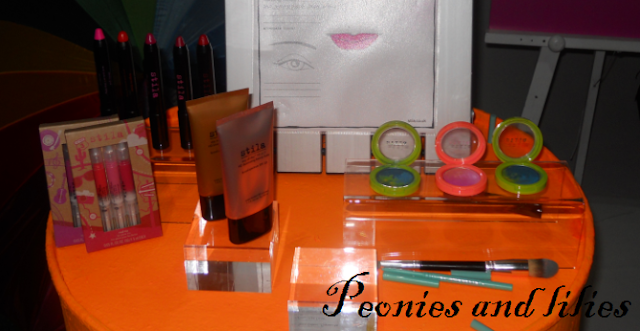 What do you think about the new Bourjois SS13 collection? Will you be travelling anywhere nice this summer? At the event, I was immediately drawn to their new After glow lip colors. It's no secret that I love moisturising lip crayons, and I think the 6 new shades will be perfect for a pop of bright colour during the summer months. Being a festival themed collection, the lip crayons will glow in the dark, something which I wasn't too sure about (fluorescent lips are really my thing), but I'm reassured that this only happens in the presence of UV light, so on a day to day basis, it should be just like any other lip colour. 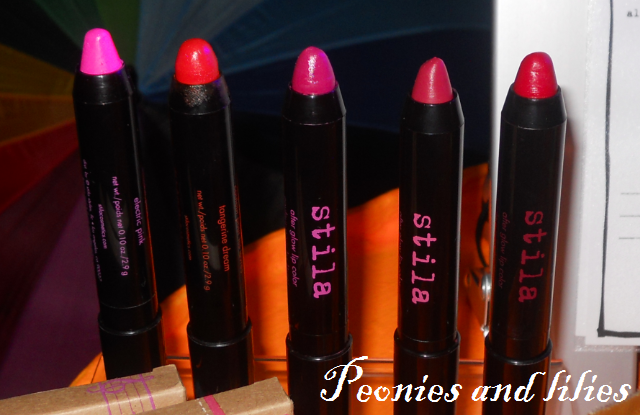 Along side the new lip crayons, there are also 5 new Stila countless color pigments. I think the colours are quite bright and daring, but I love the swirled tie dye effect and pigment wise, they're second to none. There's also a new turqoise eyeliner, which comes in both a liquid and pencil format. Despite the initial hype, it seems that BB creams are here to stay, and Stila are lauching 2 new versions. 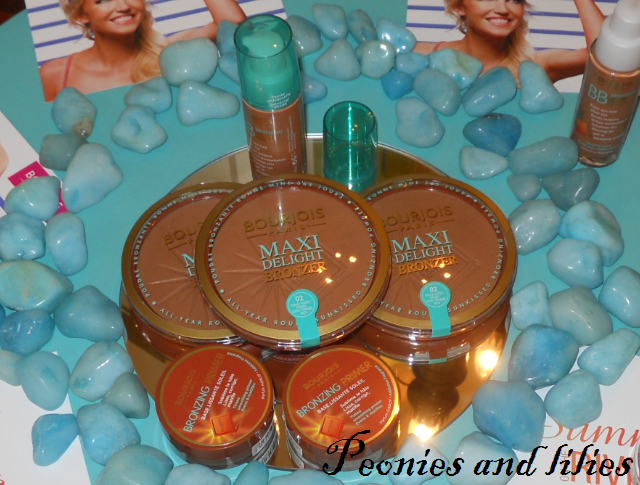 A bronzing beauty balm for a sun kissed glow, and an illuminating version for radiant hydrated skin. Finally, they're introducing 2 new lip glaze trios, which I think these are an absoulte bargain at only £12 each. 'Road trip' would be top pick, but if you like baby pinks then you'll love the 'Music festival' trio. What do you think about the new Stila SS13 collection? Have you tried any of their original lip glazes? 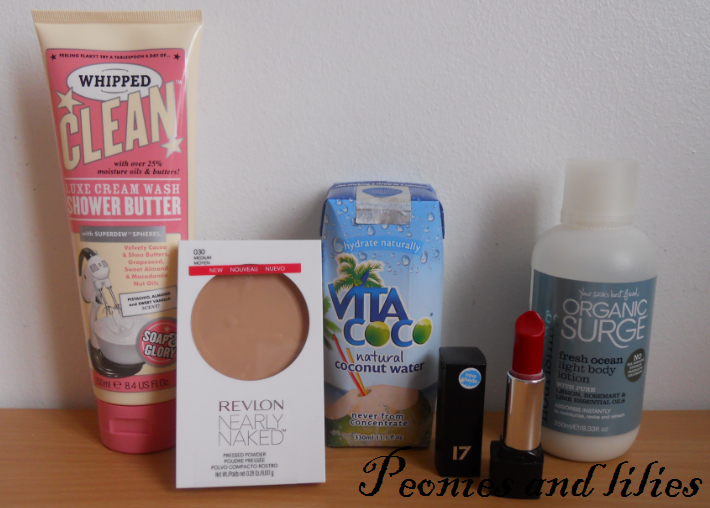 As always, it was a mixture of real favourites and products that I didn't get on so well with. I really didn't like the Sure deodrant, but the other items were all nice enough to use up. Of the 7, my favourite would have to be the Nioxin shampoo, and I would definitely consider repurchasing in the future. 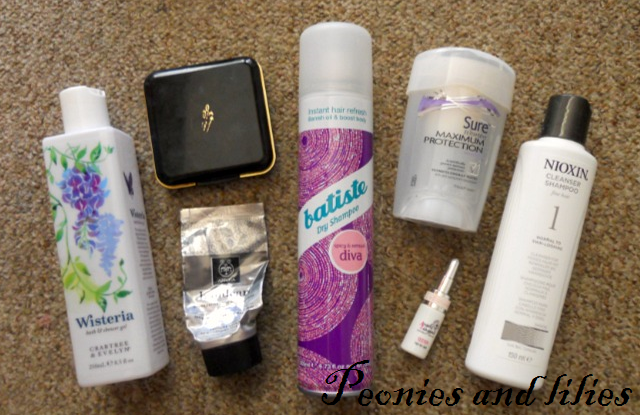 Batiste dry shampoo remains a firm favourite as well, although I have at least 3 cans on standby, so won't be running out anytime soon. How did you get on this month? What are your least favourite products? A cake scented shower gel? Yes please! And not only does this smell amazing, it's also packed with essential oils and moisturising butters so I can get away with not moisturising every day. Great if like myself, you're always in a rush or running late in the mornings. On days when I do moisturise, this is my body lotion of choice. 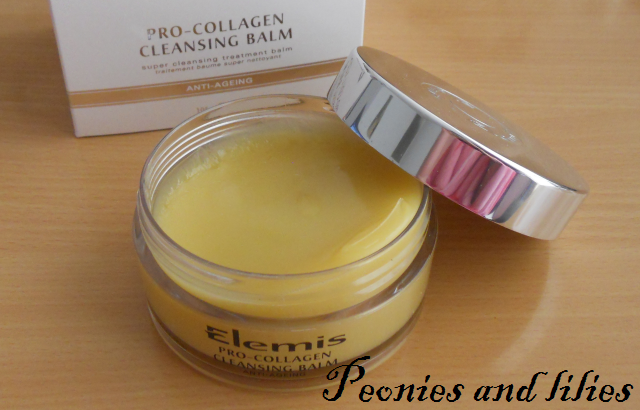 It's light, quick absorbing and leaves my skin feeling hydrated but not greasy. I've spoken before about my love for the million dollar anywhere balm, and this is like the body lotion equivalent. It's got a similar lemon sherbet smell and I think it's so refreshing and perfect for Spring. Face powder is an everyday essential for me, and I like how this leaves my skin matte, but not flat. The packaging is quite bulky, but it comes with it's own sponge applicator and mirror, which is handy when touching up on the go. The formula's lightweight too, so I can get away with reapplying several times without it caking up or oxidizing. It's no secret that I love sheer moisturising lip colours, and formula wise, this one fits the bill perfectly. It's been my go to lip colour for the last few months, and I love that it's got a little mirror hidden away in the lid too. Coconut water has been around for quite some time now, but it wasn't until recently that I realised just how good they were for you. It's high in potassium, less sugary than traditional sports drinks but just as hydrating and contains natural anti-oxidants. I've been drinking this whenever I exercise, original is my favourite, but the pineapple flavour's rather tasty too. Have you tried any of these products? What were your March favourites?